Spane is a smart and healthy 16 now, running and jumping into everything. This photo was taken of Spane asleep in his basinette, a week before Christmas, 2003. At that point in Spane's life, he was trying to hold up his head, could already hold his bottle and drank four ounces of formula every three hours. He is really growing. We had a great time that Christmas, and then we celebrated the New Year. Champagne for Mom, and a double bottle for Spane! In 2004, we went to dinner at my good friend Helen's house, and everyone thought he would be great at USC, but he'll have to wait for that a little while. I think it's a long time between Language Development Lab and college football. This year, we went to dinner at my roommate Jason's mother's house, and sorry to say, Spane spent New Years Eve happily asleep in his crib. 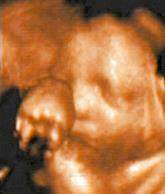 This is an ultrasound of Spane taken on September 16, 2003. Apparently, Spane was none too happy about the procedure, because you can plainly see he is trying to punch out the doctor. Well, some people have said that his fingers show that he was getting ready to "give the finger" to the doctor. 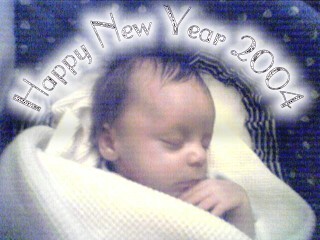 Spane was conceived on February 24th, 2003 at about 4:00 am. This was right after a small earthquake. Spane's father is afraid of earthquakes, and asked me to hold him, and well, you know what came next, right? I mean you want to talk about feeling the earth move! At first, I didn't think that I was pregnant. Then, one morning, I noticed that my urine smelled really, really bad. It has always been my experience that that meant that I was pregnant. Other times before this, I had not been ready emotionally to have a child, but this time, a smile crept on my face, and I was thrilled. Of course, I wasn't sure that was the case, and one day, I got really bad gas pains. They stayed the next day, and when I took a bath, I could see the gas going across my stomach. I decided to go to the emergency room. The doctor told me it wasn't gas, it was a baby. Oh thrill! I really was pregnant!